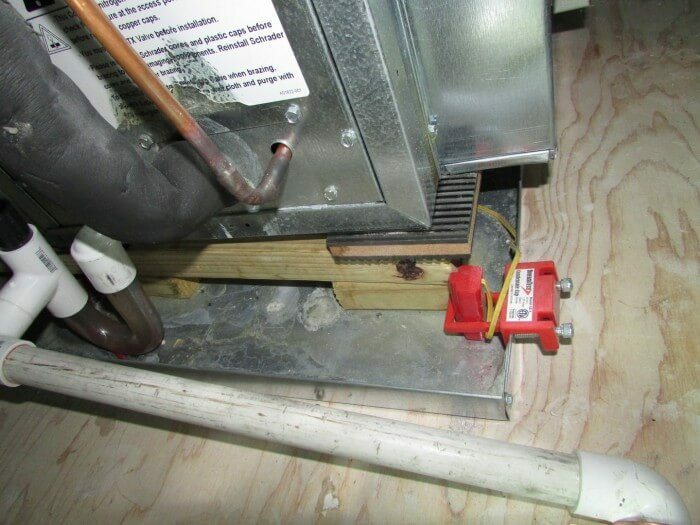 Last week’s blog post about inspecting air conditioners was all about traditional air conditioners, with an evaporator coil sitting on top of a furnace in a basement. With these systems, condensate leaks can lead to a mess, but it’s nothing compared to a condensate leak that occurs at an air conditioner in an attic, or really any place that has finished space below. I came across a leaking unit a couple of weeks ago, and found moisture all throughout the first floor and basement ceilings. 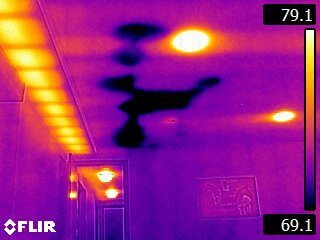 The dark blue spots in the image below are wet areas on the basement ceiling, none of which were visible to the naked eye. I don’t come across many of these units in attics, so I occasionally need to refer back to the state code requirements for these units to make sure the condensate disposal system is properly installed. I meant to put together a nice little user-friendly summary of the condensate requirements for the inspectors in my company, but I decided this might make for a good blog topic too, so here they are. For this post, I’m basically paraphrasing section 307.2.3 of the 2015 Minnesota Mechanical Code, but I am leaving out some info, so read the real code section if you want to know every little detail. This is the section that deals with condensate disposal for areas where damage could occur to the building if condensate leaked. Like in an attic. 1. A drain pan with a separate drain – A separate drain pan can sit underneath the unit, and this drain pan needs to have its own separate drain line. This pan needs to be at least 1-1/2” deep, and must be at least 3” wider in every dimension than the condenser unit. 2. A drain pan with a shutoff device – a pan with the same dimensions as listed above can be installed without a secondary drain, provided there’s a shutoff device installed that meets UL 508. I don’t own that standard and I don’t know what it says, but I’ve seen plenty of these shutoff devices, and they’re pretty simple. They sit inside the drain pan or they’re mounted to the side of the drain pan. It’s that red device in the photo below. That particular one is called the Condensate Cop. If water fills up the pan, a float shuts off the air conditioner. This type of device is quite simple and effective, and this is the most common method used in Minnesota attics. 4. A separate overflow drain – a separate overflow drain line can be connected to the secondary drain opening that is built into the equipment, but if this is done, it needs to drain to a conspicuous location. It can’t just drain to a floor drain or to the outdoors. The purpose of this is to alert someone that water is coming out of some place that it shouldn’t, and there’s a problem. Ideally, someone would go check it out and clear the clog in the clog that’s causing condensate to leak to an unusual location. 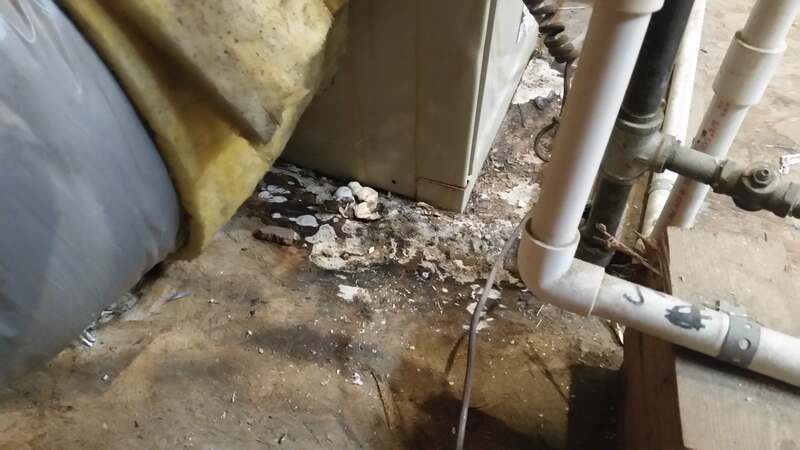 While it’s not common to find air conditioners in attics here in Minnesota, I probably find the condensate disposal systems improperly installed at least half of the time.